When I came to Stewart Island back in 1969 as Ranger one of my projects was to complete the North West Circuit hiking trail. This is an 8 day hike which takes you up the east coast of the Island past Christmas Village, Long Harry and down the western side of the Island to Mason Bay, and then back across the Freshwater, North Arm and ending back at Oban. Back then we saw so few people on the tracks you could have been forgiven for wondering why we built these trails. And even with our status as temperate rain forest (read lots of rain days) the trails were seldom muddy. But now with the massive increase in numbers of hikers in our back country sadly many of our trails are very muddy. And to some extent the Stewart Island experience is, for hikers at least, synonymous with mud. When Rakiura National Park was gazetted in 2002 the key project was a massive upgrade of the 5 or 6 k of trails on Ulva Island. Ulva Island is predator free and is as close to a pristine environmental experience as any place the general public has access to in all of New Zealand. As Jewel in the Stewart Island Crown Ulva Island has something in the order 30 odd thousand visitors per year, most over a 5 month summer period. Such a high number of feet, coupled with measurable rain on 7 days out of 10 on average (Temperate Rain Forest) and very friable soils would rapidly turn the trails into quagmires. The solution was to construct the trails to a very high standard. Well formed track bases, mud stop underlay, timber track sides and a high quality crushed “dunnite” walking surface makes walking on Ulva a very visitor friendly experience. So good that my overseas guests are all very very impressed with the superb quality of back country infrastructure in New Zealand. The down side is that it’s very very expensive to fly gravel (heavy stuff) into the track sites. Back in 2002 the bill to construct the 5 or 6 k of trails on Ulva was a bit under $600,000. So sadly DoC cannot metal all of the Stewart Island Trails. 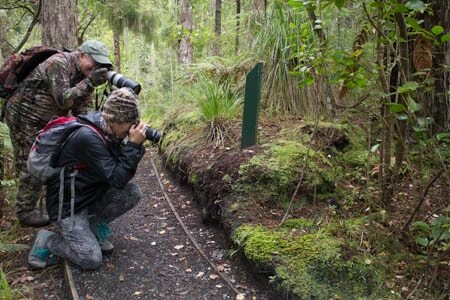 But one they have done is the Rakiura Track, which is one of the “Great Walks”. Great walks are the premiere hiking trails DoC administer in New Zealand, and as such are very well patronised. A couple of days ago I had some guests on a road tour, and as we drove down to Lee Bay we saw a helo working. 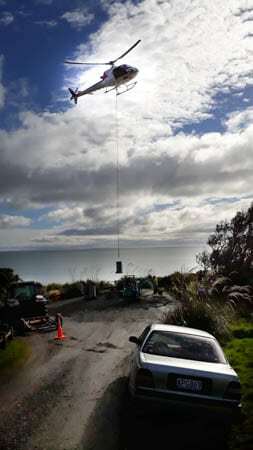 It was picking up drums of track gravel and flying out to part of the Rakiura Track where the gravel would be layed. 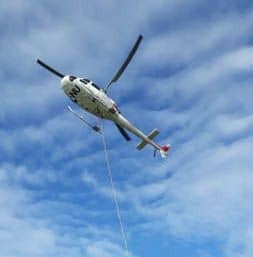 So for my New Zealand guests who had enjoyed the trails it was a good demonstration of the great infrastructure work our Dept of Conservation does. Good and all as the metaled trails are they do require regular maintainance. On Ulva Island summer volunteers regularly sweep fallen leaves off the metal, which, if left alone would turn in time into humus and soil, and then mud. Sweeping of course, plus the action of feet shifts some grave off the track. This needs to be replaced every several years, again at great expense …. helicopters again. I suggested that maybe tar sealing although initially quite expensive might in the long term be cost effective in retaining the gravel on the track, and leaf removal might be achieved by using a blower rather than the labour intensive brooms. This has been trialed on a short length of track on the Petersons Hill Deep Bay trail, and appears to be very successful. I understand that a section of heavy use Ulva Trail will be done in the near future.